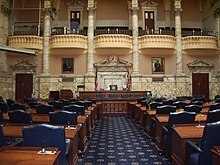 The Maryland House of Delegates originated as the Lower House of the General Assembly of the Province of Maryland in 1650, during the time when it was an English colony, when the Assembly (legislature) became a bicameral body. The Lower House often fought with the Upper House for political influence in the colony. The Upper House consisted of the Governor and his Council, all personally appointed by Lord Baltimore and Proprietor of the Province, and thus tended to protect his interests in Maryland. Conversely, the Lower House tended to push for political change in the colony, claiming to be the true elected representatives of the people. The Maryland Constitution of 1776 formally established the modern House of Delegates. Initially, representation was based on geography as the voters of each county elected four delegates, and two each were elected from the towns of Annapolis and Baltimore. These delegates served one-year terms (increased to two years in 1845, and four years in 1922, as it is today). The current pattern for distribution of seats in the House of Delegates began with the legislative apportionment plan of 1972 and has been revised every ten years thereafter. The plan created 47 legislative districts, many of which cross county boundaries to delineate districts relatively equal in population. Each legislative district sends three delegates for a total of 141 members of the House. Some of the larger districts are divided into delegate sub-districts to provide local representation to areas not large enough to constitute an entire legislative district. Smaller caucuses might group Delegates by identity, such as the Women's Caucus, notably the first women's legislative caucus founded in the United States. The Asian-American and Pacific Islander caucus, or Legislative Black Caucus are other examples. Delegates may also organize by issue or area of experience, such as the Veterans' Caucus. In addition, delegates from a certain county, smaller towns, or Baltimore City might organize its delegate delegation into a caucus-style group, such as the Baltimore City Delegation or the Western Maryland Delegation. Current leadership in the Maryland House of Delegates.